The Middletown Regional Airport/Hook Field in the top right of the photo can easily accommodate corporate and cargo jets on its 6,100-foot runway. Murals, such as this piece depicting bright and whimsical musical instruments and notes, invites people to visit Governor’s Square in downtown Middletown at the corner of Central Avenue and Broad Street. CLOCKWISE FROM TOP LEFT: The mural at the corner of Central Avenue and Verity Boulevard in downtown Middletown is a snapshot in time of the former Port of Middletown on the Miami-Erie Canal. The historic Goetz Tower is being renovated into marketrate apartments and first-floor offices. AK Steel’s $36 million Research and Innovation Center opened in Middletown in 2017. 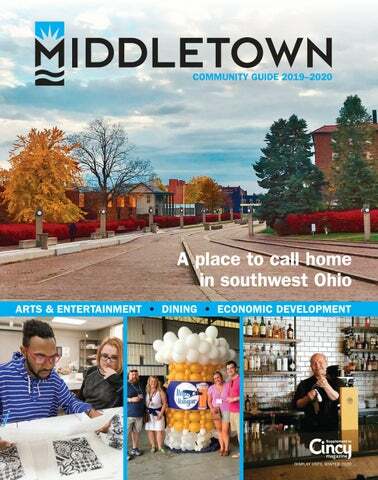 Middletown officials hope their recently approved Downtown Master Plan continues that interest in businesses investing in downtown. The Downtown Master Plan was developed to diversify and modernized the local economy, turn the city’s liabilities into future assets and improve the city’s community image. One asset the city soon hopes to capitalize on is the rehabilitation of the historic Goetz Tower, says Ekey. The vacant office building will soon be renovated into 16 market-rate apartments and first-floor offices, she says. “That will be a major launch into residential living in downtown,” says Ekey. Other development projects are expected to follow closely behind the Goetz Tower redevelopment, she says. 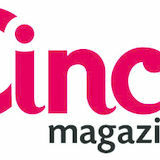 Schools and colleges offer plenty of budget-minded options for advanced learning BY SCOTT UNGER The Middletown branch campus of Cincinnati State offers more than 19 associate’s degrees and 15 certificate programs. ence, technology, engineering, arts and mathematics) learning and gives students the opportunity to embrace technology through classes like an augmented and virtual reality course. Students engage in computer coding, making programs that are then installed into VR headsets and enjoyed by fellow students. So far the students have surprised the teachers, completing six weeks of curriculum in just three weeks. “That’s how fast they’ve plowed ahead,” Beadle says. Students pursuing the arts also have a variety of choices, with a new theater and band, orchestra and show choir rooms. The campus has three gymnasiums, including the 2,200-seat Wade E. Miller arena, which features all the bells and whistles of a college facility. Four large LED video scoreboards, a sound system, walking track, weight room, wrestling room, offices and a conference room surround the professional style court named after Middletown alumnus and NBA Hall of Famer Jerry Lucas. Although the schools have only been a short time the impact of the project has been felt immediately in the community and especially among the students, Beadle says. Miami University Middletown Campus recently introduced a single tuition rate for all four years. “You can feel that culture shift, they’re proud to be here. To know that we’re investing in them fills them with a lot of pride.” Once students graduate from high school they have the opportunity to pursue higher education at affordable rates right in their back yard at the Cincinnati State Technical and Community College and Miami University regional campuses. Miami University Middletown Campus recently introduced a single tuition rate for all four years, giving students the ability to earn a Miami University degree at a lower rate than the main Oxford campus, according to Regional Dean Cathy Bishop-Clark. Cincinnati State emphasizes career coaching by putting incoming students through an aptitude test that points them to their area of interest. At approximately one-third of the cost of in-state tuition at main campus, students can pursue 18 different bachelor’s degrees while staying close to home and saving money. “This is a Miami degree, there’s no qualifications about that,” Bishop-Clark says. “It’s a steal.” The Miami University Middletown Campus is expanding on its bachelor’s offerings as well, with a biological sciences major pending state approval and several other options being explored. New majors are chosen based on demand at the national, state and regional levels, as Miami employees work closely with advisory boards and area chambers of commerce. The campus is also following the trend of offering online courses, with approximately 30 percent of courses available online, including some entire degree paths. The staff works hard to create an online community and provide professor access to students throughout the learning process and online learning provides an opportunity to those who don’t have time to make it to day or evening classes on campus, Bishop-Clark says. “Some students have got families, they’ve got work. Online learning, for some people, it’s just a much more convenient way to fulfill a high quality Miami education.” In order to get students on the right path, the campus is creating a career services facility inside Logan T. Johnston Hall that will include expanded mentoring and advising services for incoming students. ABOVE AND LEFT: The new 7-12 grade Middletown City Schools campus opened in September 2018 featuring an array of options and advantages for the estimated 6,300 students. Kettering Health Network Middletown opened in August 2018 and employs 110 people. usinesses choose a city or region for many reasons, from transportation and talent to affordability and local government. For the companies that call Middletown home it’s the people and the community that make all the difference. “Everybody kind of knows each other and cares about each other. That’s what makes (Middletown) special and I’ve been honored to begin to get to know and begin to be a part of that family atmosphere. It’s just a really awesome community,” says Daniel Tryon, executive director and administrator of Kettering Health Network Middletown. Because of this, three of the city’s employers recently have double-downed on Middletown and remain committed to both staying and growing. A MIDDLETOWN TRADITION AK Steel has been an important part of the Middletown community since 1899 when it first opened as The American Rolling Mill Company. Today, AK Steel employs 9,200 people at its manufacturing facilities in the United States, Canada and Mexico—2,400 of which are employed in Butler County across its AK Steel Middletown Works steel operations, its new Middletown Research and Innovation Center and its headquarters in West Chester. What hasn’t changed is its commitment to the city. The WorkLink bus route—a joint effort between the city of Middletown, Atrium Medical Center, city of Monroe and the Butler County Regional Transit Authority—will connect people within the region to available jobs. The annual Ohio Challenge Hot Air Balloon Festival in Middletown includes a hot air balloon competition, outdoor concerts, food vendors, arts & crafts and carnival rides. Hops in the Hangar is a blend of craft beer fans and aviation enthusiasts in an airplane hangar at the Middletown Regional Airport/Hook Field. Relax and Have Fun The Great Miami River Recreational Trail offers good times and great memories BY TIM WALKER ABOVE: The Great Miami River Recreational Trail offers opportunities galore for visitors to stroll, ride a bike, relax and enjoy a pleasant time along the Great Miami River. RIGHT: The new River Center at 120 Carmody Blvd. includes drinking water, restrooms and reservable meeting space. Central Pastry Shop in downtown Middletown has been making pastries and cakes since 1949. There are plenty of delicious dining options in Middletown. BLAST FURNACE PIZZA: 1126 Central Ave., (513) 438-1919, blastfurnacepizza.com. MURPHY’S LANDING: 6 S. Broad St., (513) 649-8867, murphys-landing.com. BOURBON’S CRAFT KITCHEN & BAR: 2231 N. Verity Parkway, (513) 217-0099, bourbonskitchen.com. CENTRAL PASTRY SHOP: 1518 Central Ave., (513) 423-4431, centralpastry.com. THE SPINNING FORK: 32229 N. Verity Parkway, (513) 649-8201, facebook.com/spinningfork.middletown. COMBS BBQ: 2223 Central Ave., (513) 849-2110, facebook.com\combsbbq. STEFANO’S ITALIAN CAFÉ: 2200 Central Ave., (513) 422-9922, stefanositaliancafe.com. STRAIGHT SHOT COFFEE CO.: 6589 Terhune Drive, (513) 518-7187, sshotcoffee.com. GRACIE’S: 1131 Central Ave., (513) 915-7476, graciesmiddletown.com. THE JUG: 3610 Central Ave., (513) 424-1677, facebook.com/the-jug. JAVA JOHNNY’S: 3534 Central Ave., (513) 727-9722, javajohnnys.com. TRIPLE MOON COFFEE CO.: 1100 Central Ave., (513) 849-2220, facebook.com/triplemooncoffee. MILTON’S DONUTS: 3533 Roosevelt Blvd., (513) 422-8612, facebook.com/miltonsdonuts. TOP: Arts and culture provides a vibrant community for Middletown residents. ABOVE: Musical entertainment helps bring visitors to downtown Middletown. LEFT: BeauVerre Riordan Stained Glass Studios creates custom-designed stained glass windows. The Middletown Historical Society’s Canal Museum, 120 N. Verity Parkway, was built in 1982 as a replica of a lock tender’s house on the Miami-Erie Canal. It is open on Sundays from 2-4 p.m. during the spring, summer and fall. The Downtown Middletown Designated Outdoor Refreshment Area (DORA) District, Ohio’s first designated outdoor refreshment area that allows people to buy a beverage from a liquor permit establishment within the DORA boundaries and walk around with that drink, is in operation from 12 p.m. to midnight seven days a week. From 5-9 p.m. on the First Friday of every month is when downtown Middletown neighborhood businesses, boutiques, eateries and galleries keep their doors open late. The annual Ohio Challenge Hot Air Balloon Festival takes place each July in Middletown that includes a night balloon glow. Middletown has plenty to of fer during the holiday season. Middletown Regional Airport features the longest runway of any non-towered airport in southwest Ohio.